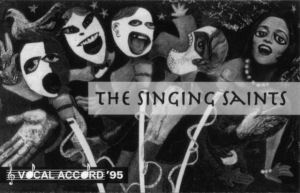 The first Vocal Accord (held in February 1994) was so successful that a second was scheduled the following year. It was decided that a recording of the concert would be useful, not to the current group, but all of those performing, including the Sinners, Instrumentally Challenged and Binghamton Crosbys. We commissioned some original artwork from my friend, Andrew Hotis, to save on production costs as well. Unfortunately, when we saw the proof of the album cover, something was very wrong. The production company had put “The Singing Saints” on the album cover and refused to redesign it unless we paid them another $500, more than half the cost of the whole project!!! We knew the Sinners and IC would be upset that the cover had the Saints’ name on it and not theirs. We just couldn’t afford to fix the proof. We hoped they would understand since the albums were completely funded by the Saints. IC accepted our apology, and, since they hadn’t paid anything for the tapes, they really couldn’t argue too much. But they were understandably disappointed, and the Saints were embarrassed they hadn’t been able to deliver the promised product. The Sinners, on the other hand, were extremely upset! They never did except our apology. In the end, it was just one of those awkward, unfortunate things; we tried to do some friends a favor, and it backfired. We’d do it again, though. And this time, we’d be even MORE specific with the production company!